From the very first day of each year until December rolls around again there are children everywhere wishing for something special to come from Santa on Christmas morning. In a town in Montana all the children are counting down the days until that exciting morning. For a little six-year-old girl named Suzy Jenkins the only thing she wants this Christmas is something she has asked for the last couple years, a pony of her own. All year she has been reading up and getting everything ready for her new pony including saving a few carrots as treats. She has also made sure to write a perfect letter to Santa and give it to her teacher at school so it can be mailed to the North Pole, because everyone knows that mailing a letter is the best way to tell Santa exactly what you want. In addition to sending a letter Suzy has also made sure to be extra nice this year with everything she does. She even shared her candy cane with a lonely man named Carl, and she did not tattle on the boys who had bullied her as she thought that Santa probably would not like tattling. Unfortunately, Suzy’s mom does not seem as excited about the idea of a pony as Suzy does, for every time Suzy mentions it her mother says something such as “a pony costs too much to feed,” or “we can’t handle taking care of a pony right now.” Since Suzy sees that getting a pony is upsetting to her mom she decides not to mention it anymore but she does keep asking Santa to make her wish come true. She can feel that this will be the year that some true magic happens and she will find a pony just for her in the barn on Christmas morning. This was a wonderfully sweet and refreshing read and even though it was not a long book I did enjoy the story. 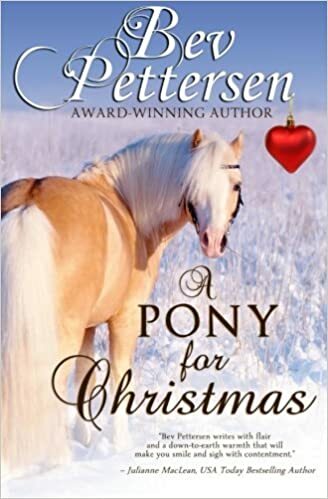 There were a couple Christmases when I was a little girl where I remember wishing with all my might that Santa would bring me a horse so it was easy for me to relate to the thoughts the character of Suzy was having. Thinking about a beautiful pony or horse with flowing mane and tail waiting for you in a barn is something quite magical and Bev Pettersen captures this feeling perfectly as she brings to life a heartwarming story. That innocence of childhood is something that, while it lasts for just a short time, is a memory to be cherished. This book could definitely be enjoyed by any age group and especially young children starting to read early-reader chapter books. Quill says: A heartwarming story that brings together the wonderful innocence of children and the magic of the Christmas season.